A remote and rugged classic point to point course traversing the Siskiyou Mountains Range in Southern Oregon. Starting in Williams, OR the course winds it way east to Ashland, OR on a mixture of single track trail, dirt road, with less than 6 miles of pavement. The course boasts over 20,000ft of climb and 20,000 ft of loss with 4 epic climbs to 7,000ft and fantastic views of Mt Shasta and Mt McLaughlin. Tent sites are available at Pacifia. There are outhouse facilities and there will be plenty of camping spots available. Lodging is also available at: Applegate River Lodge, The Jacksonville Inn, Magnolia InnStage Lodge, Jacksonville Suites, Elan Guest Suites, Riverside Inn, Holiday Inn Express, La Quinta, Redwood Motel, Ashland Springs Hotel, Palm Cottages, Super 8, Holiday Inn Express, Plaza Inn Ashland and Econo Lodge. There will be 14 aid stations along the course. Of these you will pass through 11 that are fully stocked. Those stations will provide SUCCEED! S! Caps for electrolyte replacement, electrolyte drinks, water and a limited number of GU packets. Beyond that each aid station team will have an assortment of the usual "race food". The remaining 3 aid stations are water only. You must complete a 50 mile trail race prior to starting this 100 miler. 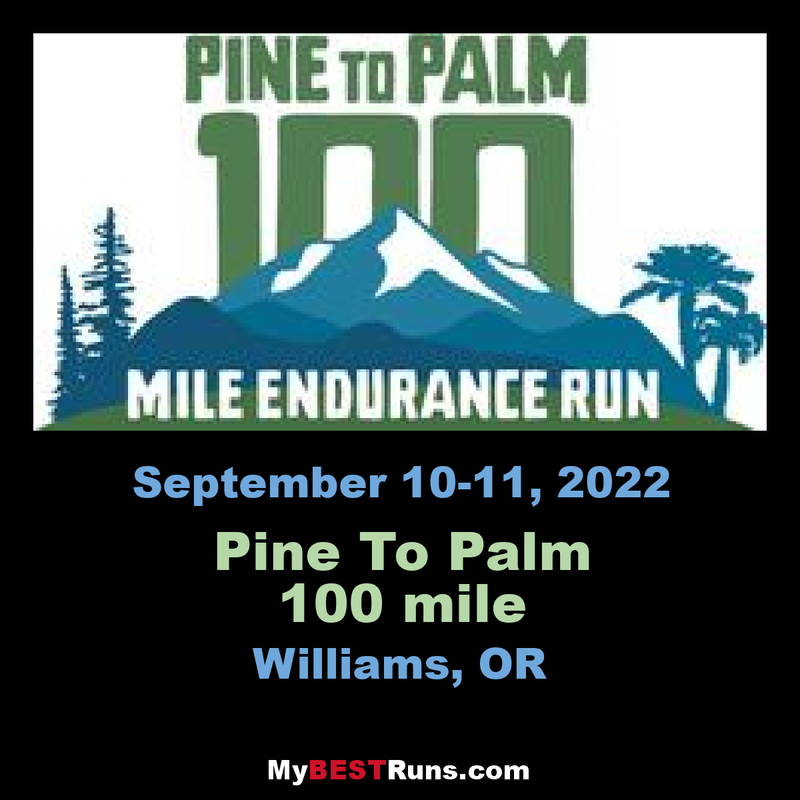 If the course has any trail component and is 50 miles long, then you qualify for the 2013 Pine to Palm 100 mile endurance run.